This is democracy in action in the state of Wisconsin! Authorities say an anonymous caller threatened to detonate a bomb inside a mosque in Tennessee on the 10th anniversary of the Sept. 11 terror attacks. According to a police report, an unidentified person made the threat Monday in a voicemail left at the Islamic Center of Murfreesboro. The report says the message included extreme profanities and derogatory remarks toward Muslims. Murfreesboro Police spokesman Kyle Evans told The Associated Press on Wednesday that security at the mosque has been increased and that marked and unmarked vehicles are patrolling the area. Evans says federal authorities are helping in the investigation. The mosque has been the target of vandals who defaced signs at the site where it plans to build a bigger site of worship. Last year, arsonists also torched construction equipment there. Federal authorities are warning local law enforcement agencies of a potential terrorist threat involving car bombs that could coincide with the 10th anniversary of the Sept. 11 attacks, several sources told Fox News on Thursday. The Department of Homeland Security confirmed that it had information about a “specific, credible but unconfirmed threat,” and the White House said President Obama was briefed Thursday morning and has been updated throughout the day. How many Americans have been killed in terrorist attacks inside the United States since the September 11, 2001, atrocities? Arguably 16. Egyptian Hesham Mohamed Hadayet killed two Israelis at the El Al ticket counter at the Los Angeles airport on July 4, 2002. On June 1, 2009, Abdulhakim Muhammed killed one soldier at a recruiting center in Little Rock, Arkansas, and Army psychiatrist Maj. Nidal Hasan killed 13 soldiers during a shooting rampage in at Fort Hood, Texas in November 2009. Checking the Global Terrorism Database, one finds that an additional 14 Americans were killed in broadly defined domestic terrorism incidents since September 2001. Five died from anthrax attacks (2001); two died in an attack on a Knoxville church (2008); two are suspected to have been killed by members of the Minutemen American Defense group in Arizona (2009); an abortion provider was killed in Wichita, Kansas (2009); a guard was stabbed to death at the Holocaust Museum in Washington, D.C., (2009); two died in Austin when a man crashed his light plane into a government building over a dispute with the IRS (2009); and a neo-Malthusian terrorist was shot by police during a hostage incident at the Discovery Channel in Silver Spring, Maryland (2009). That adds up to a grand total of 30 Americans killed in terrorist incidents inside the United States in the last 10 years. Taking these figures into account, a rough calculation suggests that in the last five years, your chances of being killed by a terrorist are about one in 20 million. This compares annual risk of dying in a car accident of 1 in 19,000; drowning in a bathtub at 1 in 800,000; dying in a building fire at 1 in 99,000; or being struck by lightning at 1 in 5,500,000. In other words, in the last five years you were four times more likely to be struck by lightning than killed by a terrorist. Of course, the police and politicians will cite the lack of deaths from terrorism as evidence that their protective measures are working. Earlier this year, the conservative Heritage Foundation compiled a list of 39 terror plots that had been foiled since September 2001. Going through the list, about 23 of the plots might plausibly have resulted in terror attacks of one sort or another. Several were aimed at subways, military bases, and shopping malls. To get a feel for the number of people that might be killed in typical terrorist attacks, consider that four subway bombs killed 52 people in London in 2005; the deadliest attack on a military base killed 13; and blowing up the Alfred P. Murrah Federal Building in Oklahoma City, Oklahoma, killed 187 people in 1995. Making the huge assumption that all 23 plausible plots would have succeeded in killing an average of 100 Americans each, that means that 2,300 would have died in the last 10 years, or about 230 per year. (This implies a rate that is 10 times higher than the rate between 1970 and 2010, excluding the 9/11 attacks, by the way.) 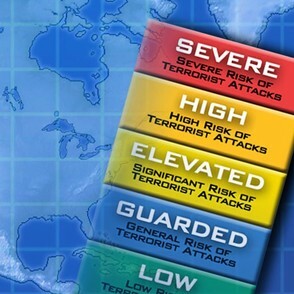 Even at this higher rate, your chances of dying in a terrorist attack would be about 1 in 1.7 million. Ohio State University political scientist John Mueller and Mark Stewart, an engineering professor at University of Newcastle in Australia recently estimated that the U.S. has spent $1 trillion on anti-terrorism security measures since 2001 (this figure does not include the costs of the wars in Iraq and Afghanistan). Assuming that 2,300 Americans might have been killed by terrorists inside the United States, this implies a cost of more that $400 million dollars per life saved. Typically when evaluating the costs of protective regulations, federal government agencies set the value of a life at about $9 million. However, terrorism is especially frightening (that’s why they call it “terrorism”), so the average citizen might want to spend double the usual amount to prevent a death. But still suggests that on a reasonable benefit-cost basis public and private spending is 20 times too much to prevent deaths from terrorist attacks. 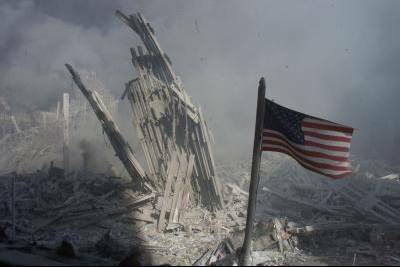 Now let’s retrospectively add the tragic 3,000 deaths from the 9/11 attacks to take into account the remote possibility that terrorists might be able to pull off another similarly spectacular assault; that still means that nearly $200 million is being spent per plausible life saved. A good bit of the trillion dollars has supported measures that threaten our liberties by beefing up the national security state. Since 2001, we all get to enjoy airport security theater; we must carry proper “papers” in order to gain admission to federal buildings; and federal minions have felt free to wiretap without warrants. On this 10th anniversary, we will certainly remember those who died so tragically. But we should also recognize that terrorism is a hollow threat to which we should not surrender one iota of our liberties.